We all knew (or at least wished) it. But now scientists in Wisconsin have proven it – Guinness is Good For You. It can even help prevent heart- attacks. Researchers at the Universtity of Wisconsin tested the health-giving properties of stout by giving it to dogs who had narrowed arteries similar to those in heart disease. They found that those given the Guinness had reduced clotting activity in their blood. When they did a similar test using lager they found no benefits. Clotting is an important indicator for patients at risk of a heart attack because they have hardened arteries. A heart attack is triggered when a clot lodges in one of these arteries supplying the heart. The most benefit seen during the research was from 24 fluid ounces of Guinness – just over a pint – taken at mealtimes. 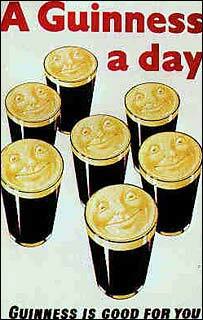 As everyone know the old slogan for Guinness was “Guinness Is Good For You.” Though this can still be seen on the old posters, Guinness no longer makes any health claims. Still it’s not that long ago that doctors in Ireland used to recommend Guinness and milk to their patients, while blood donors were treated to a glass after they had done their good deed. Maybe we can do that again?